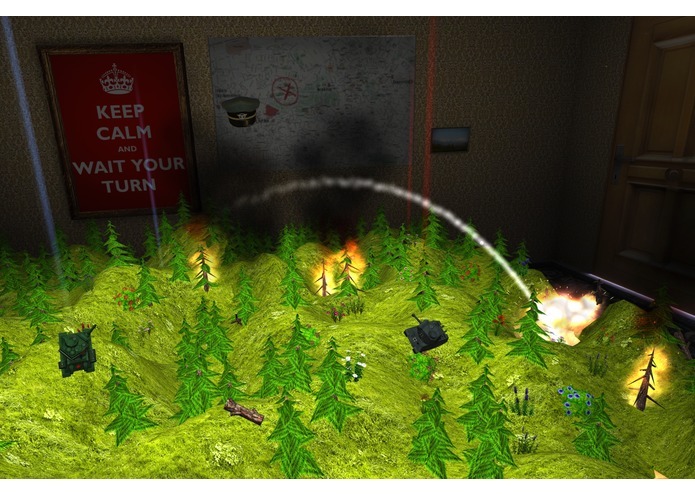 Update: Scorched Battalion was awarded Silver in the Oculus Mobile VR Jam 2015! Notes: Ideally, please wear headphones to appreciate the spatialized audio effects, and play for one turn after a tank is destroyed for reasons which will become clear once you do so. 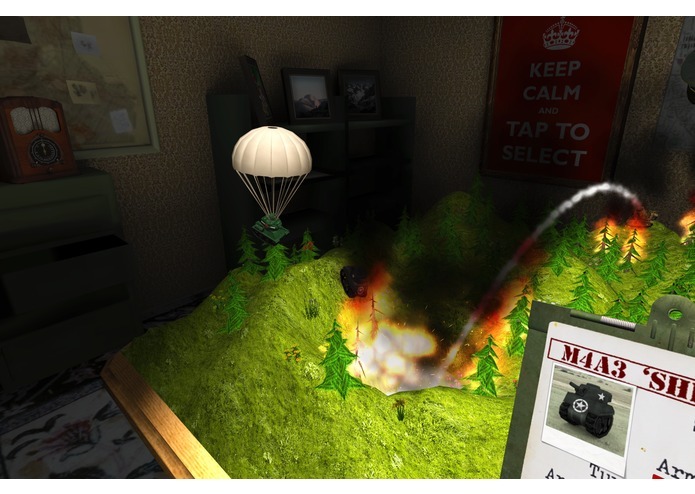 The first game of its type in virtual reality, in Scorched Battalion players take turns launching projectiles at their opponent on a randomly-generated, destructible map. 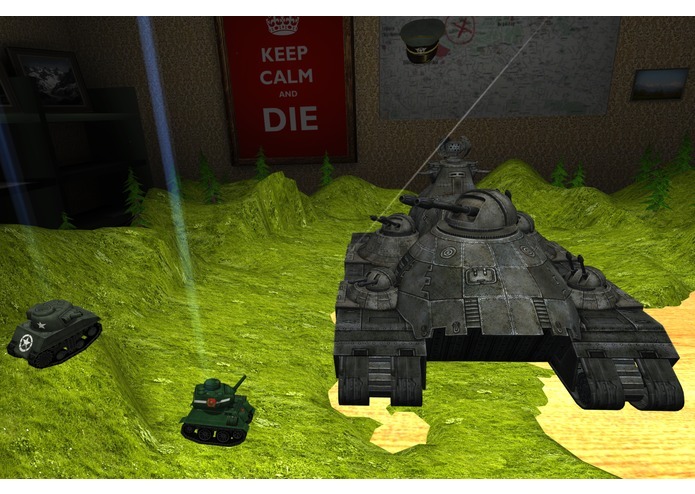 In this case, the player is seated at a wargaming table directing toy-sized tanks on a miniature landscape, and switches to viewing the battlefield from a tank's perspective to aim shots. The game features unique and memorable characters voiced by actors including Richard Newman, creating a strong connection with the player. 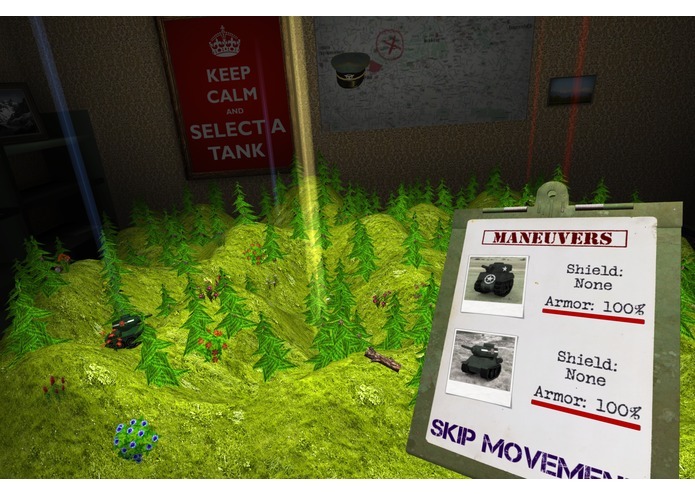 On the gameplay side, innovations include controlling more than one tank per player with simultaneous turns. Two shots are queued by each player and then fired in A,B,B,A order, increasing the importance of anticipating your opponent's moves and pre-empting them. 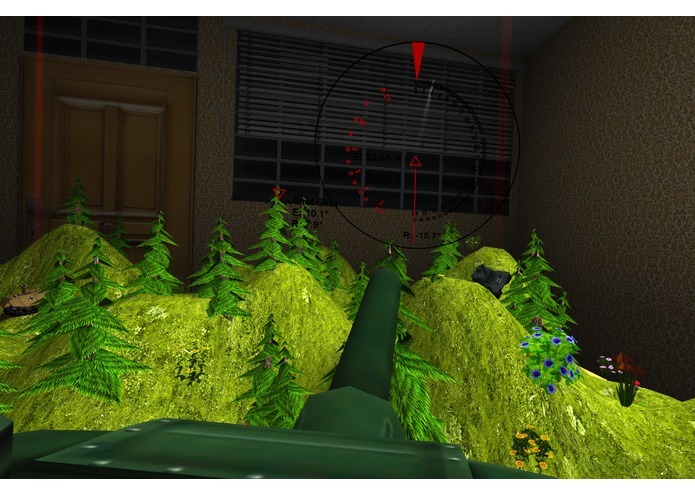 On the VR side, the game features a mouse-like selection/cursor system which is more comfortable and natural to use than standard gaze crosshairs. A floating hat acts as an avatar, showing the movements of your opponent's head, providing a low-resource-usage, low-bandwidth way to represent a multiplayer opponent on a mobile device. The system would be ideally suited to cross-platform multiplayer, and could even be used to represent non-VR players. 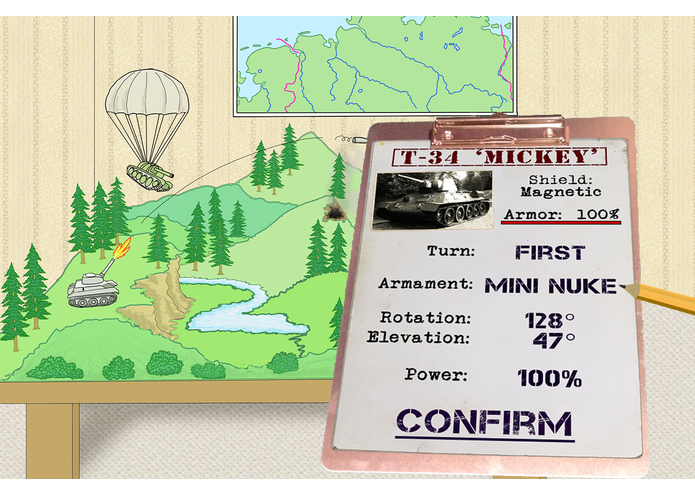 All menus and UI are represented in-world, including a clipboard with pages falling away to reveal new menus. 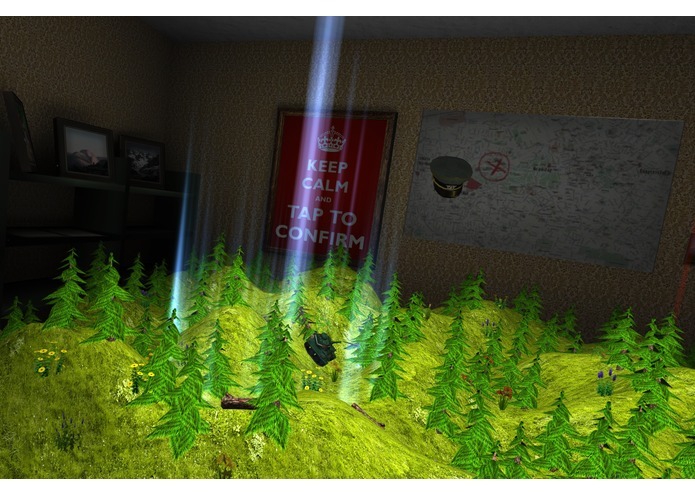 A floating pencil is used as a cursor, providing a natural and efficient way for players to control the game while remaining fully immersed in the virtual world. 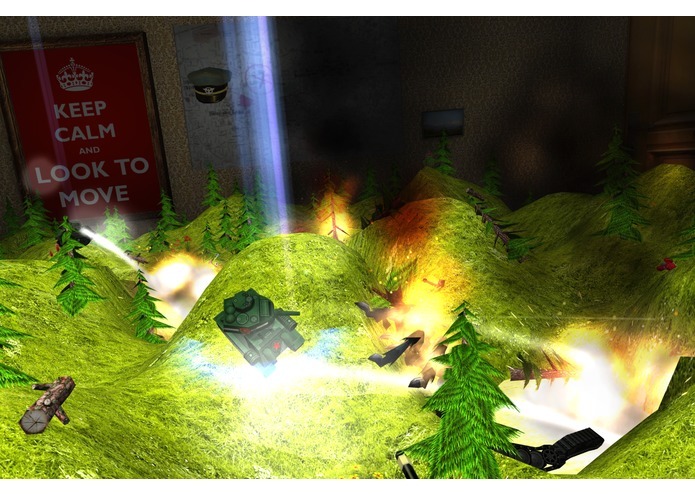 A poster in the background provides dynamic text hints to the player, and audio spatialization is used to attract attention towards important events. 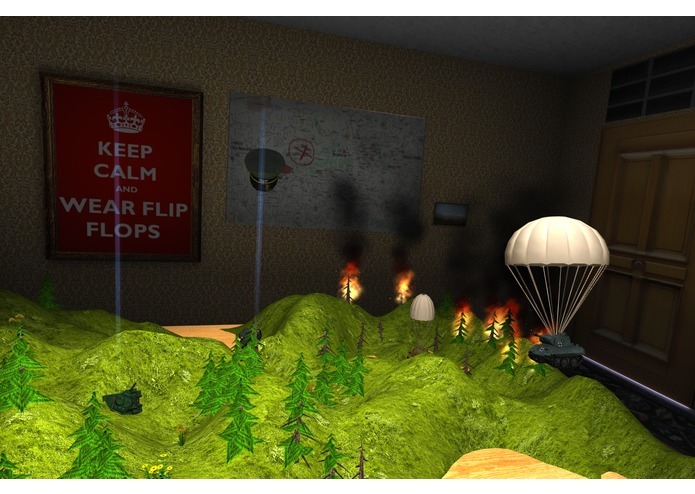 To create a deep, highly-replayable strategy game that can be controlled easily and intuitively with only gaze control, the Gear VR touchpad, and (optionally) the back button. I feel confident that this has been achieved, though in a bite-sized chunk to make judging easier. We'd like to expand the game into a full product in the future. To create an experience that can be enjoyed for long periods of time by users sensitive to simulator sickness, and without device overheating. This has been confirmed through extensive testing. To surprise players with events that would not be possible in a traditional game, abruptly altering gameplay in unexpected ways. I'd prefer people to discover these surprises for themselves, but they're included in the video and described below for judging purposes. 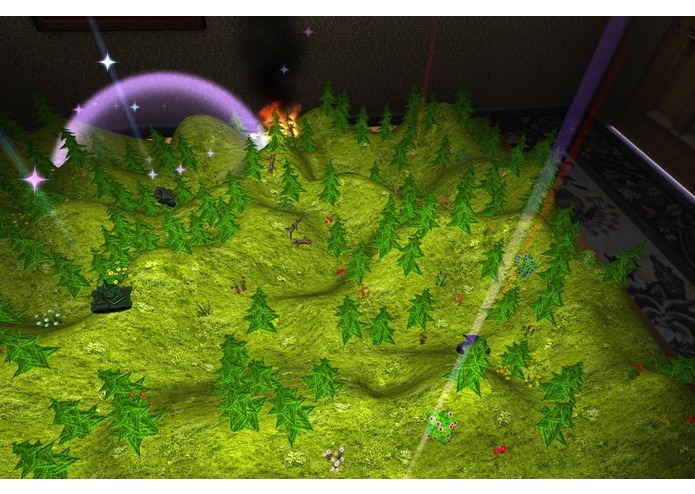 Additionally, watching tiny tanks do battle amongst miniature hills and valleys is appealing in itself, and VR allows players to understand space and distances in a way that would be impossible in a monitor-based 3D artillery game. MAJOR SPOILERS: Please do not read further if you already plan on playing the game. 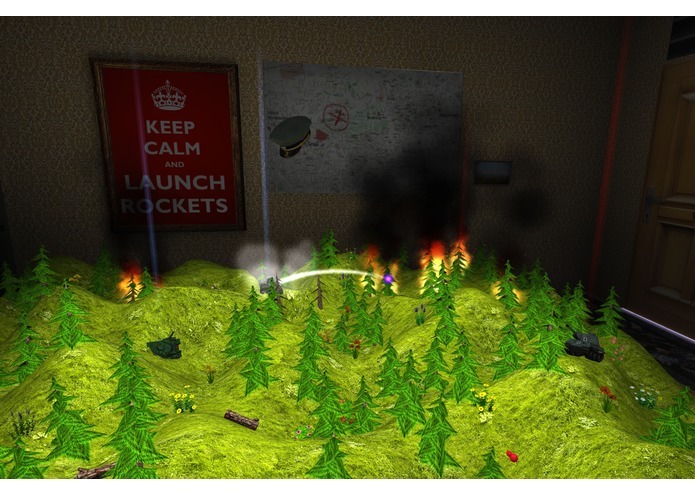 After a period of turn-based artillery combat, in-game characters attract the player's attention to something unusual above them. Once the player looks up, a large spider falls from the ceiling and enters the playfield. 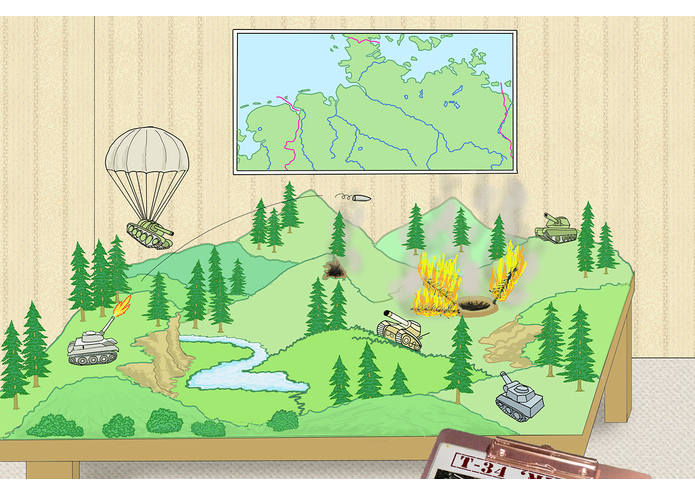 The game temporarily becomes an action game, with the opposing tank teams united against the bizarre new threat. 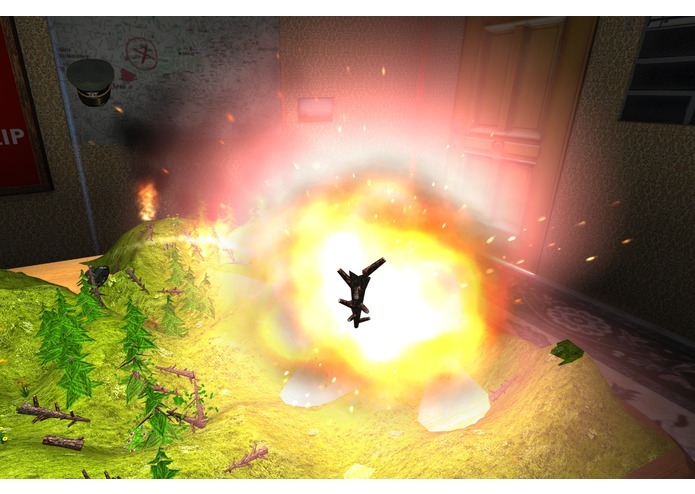 Movement is controlled by the player's gaze, and shots are fired by tapping the touchpad. Later, when the spider is weakened, your perspective changes to a first person view where you aim and fire shots at the spider directly. One final, non-interactive surprise is left for the game. Design, code, some writing etc. 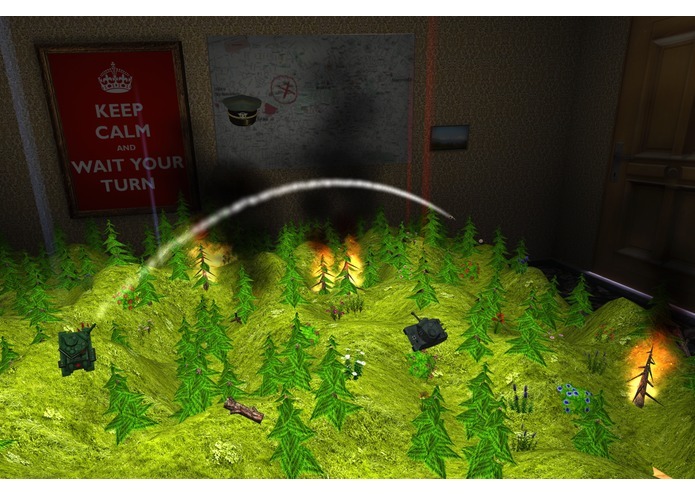 Scorched Battalion just won Silver in the VR Jam (!!) There's a new APK on the project page that adds Galaxy S6 support, some minor features, and many tweaks and bugfixes. I intend to update the DK2 version to match it in the near future. Unfortunately I ran short on time and had to make some tough choices about what to work on. A couple of extra days would have made a big difference, particularly on sound effects, but I'm still very happy with it overall. Keep in mind that the game length is compressed to try to fit within the estimated "5-10 minutes" per game.